Our eclectic range of roman blind fabrics ensures that all tastes no matter how diverse are catered for. We offer stunning fabric designs to complement any colour scheme. Our roman blinds fit neatly against the window. This allows the blind to perform well both from a privacy perspective as well as from an insulation view point keeping you warmer in winter, cooler in the summer time. Unlike the traditional roman blind, our roman blinds are of the most up to date version with a stylish cassette header rail that will enhance any modern windows beautifully. Roman blinds are easy to use and offer excellent light control. 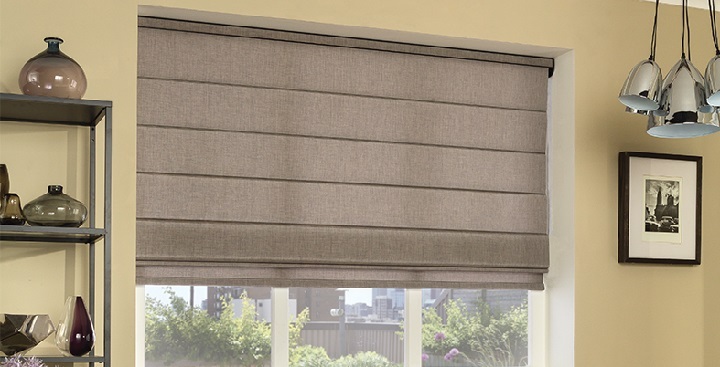 Wonderfully rich and warm fabrics are combined with a silky smooth operating system that allows the blinds to be manoeuvred to any position you require with minimal effort. We use the latest blind manufacturing techniques ensuring that your blind performs problem free for many years. For a Roman Blind quote, please fill in the form below and we will get straight back to you.